As discussed earlier, Asia dominated foreign purchases of US treasuries in Q1. This time let's take a look at how the overall composition of treasury bond holders changed between the end of 2011-Q3 and 2012-Q1 - a six-month period that saw a great deal of volatility in the treasury market. Here is the breakdown of holders at the end of Q3. 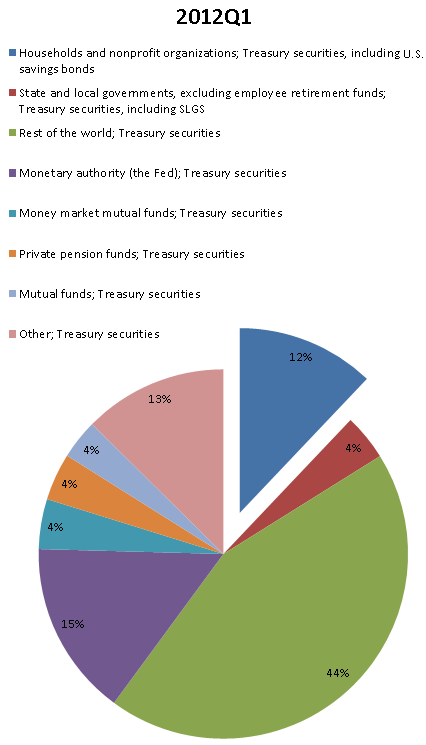 The "Other" category here represents treasuries held by federal pension plans, broker/dealers, insurance firms, banks, credit unions, and other US holders (the Fed has a full breakdown of this group but it's consolidated here to fit on the pie chart) . By the end of Q1, the composition of the holders changed somewhat. Just for reference, the total pie represents just under $11 trillion (click on the chart on the right to expand). As expected foreign holders percentage increased - driven by Asia. The Fed's percentage was unchanged. State and local governments' holdings as well as those of mutual funds, money market funds, and pensions also remained relatively static. What stands out is the category named "Households and nonprofit organizations". Treasuries held by households increased roughly by a third in six months. That jump from 9% to 12% of the total is substantial - roughly a quarter of a trillion dollars. In fact, according to the Fed, this increase in treasury holdings corresponds to the increase in US households' net worth over the period (click on the figure to the right to enlarge). Are households dumping their savings into treasuries? 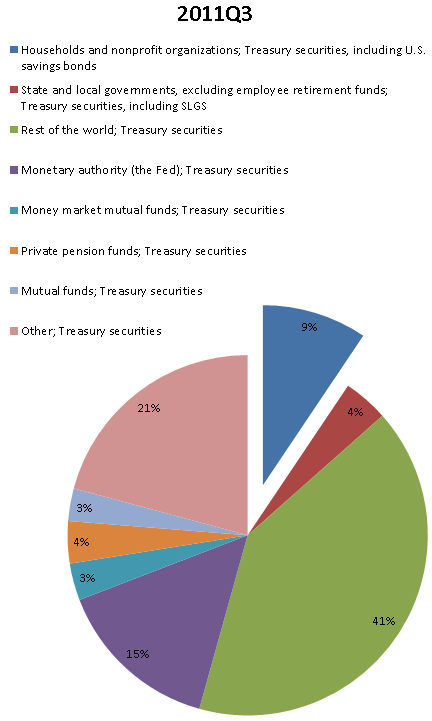 Most individuals however own treasuries via bond mutual funds or treasury money market accounts, not directly. Yet those two categories (mutual and money market funds' treasury holdings) have not increased during the six months. This puzzle was cracked by Bianco Research who pointed out last year that the Fed is simply misusing the term "household". It turns out to be nothing more than a residual account - if it doesn't fall into any other domestic category, it ends up under the household bucket. So if these are not the mom-and-pop accounts, which is what the "household" category sounds like, who is actually buying all these treasuries? Bianco Research: - Our guess is the domestic buyer is a leveraged carry trader, a mutual fund, a brokerage subsidiary or other group that does not have its own category so it gets "dumped" into the default category of "households." That means that other than foreigners, the leveraged trader has been funding the US budget deficit. As much as politicians wish to believe in stable mom-and-pop treasury purchases called "households", the reality is quite different. The reality is that the US government is relying on slowing Asia and domestic leveraged speculators for its rapidly growing funding needs. And such a scheme is clearly not sustainable in the long term.